For the APSE, I chose the OM size body since it is really the perfect size for solo fingerstyle players. The frequency response is more evenly balanced across the strings and the high strings have a sweetness that doesn't happen with a bigger guitar. It's much easier to mix in an ensemble or duet setting as well. Since I play with my wife Amy White much of the time, we like to set up her guitar to produce the big bass bottom while I fill in more of the mids and highs. It makes for a much cleaner sound. I like 12-fret necks for a number of reasons. Moving the neck forward by two frets also moves the bridge more into the center of the top, which, to my ear, gives the guitar a bit more sweetness and warmth. Physically, I find it easier to play since I don't have to extend my left arm away from my body as far to get to the lowest frets. In recent years, I've had to deal with arthritis and tendonitis issues in my left shoulder, so a shorter neck really helps me play with less pain. The development of the unidirectional soundboard by RainSong seems to have solved one of the issues that most people have with carbon graphite guitars. By replicating the grain that happens naturally in a piece of wood, this top seems to vibrate more like a wood top, resulting in a bit more of a natural response in the lower frequencies without messing up the balance in the mids and highs. It makes it extremely easy to mic the guitar for live performance or in the recording studio since EQ is not necessary to take any "boom" or "mud" out or to add highs in. The all-carbon body construction, the OM body shape and the 12-fret neck working together with the unidirectional top produces a clarity that is truly spectacular. This combination has never been available in this size guitar before and I am very excited about it. The Gotoh SGV510Z tuners are amazing and they make possible a degree of precision tuning that professional and amateur fingerstyle guitarists alike will really appreciate, especially if they use a variety of altered tunings like I do. The onboard LR Baggs Stage Pro Anthem system is a perfect match for this guitar. The built in microphone and pickup combination can be blended to get just the right amount of each in the mix. I've found that the EQ can be set almost flat since this system matches the guitar so well. I also appreciate having the built-tuner that mutes the signal when I tune. All in all, the combination is hard to beat. I'm somewhat of a traditionalist when it comes to design. I had wanted RainSong to make a plain fingerboard for many years and I also felt that if they could make it look more like a wooden guitar, it might appeal to more people in the world of acoustic guitar. The plain fingerboard and simple pinstripe sound hole rosette in place of sharks and fancy abalone seem to be more fitting on a guitar being used in this setting. And to top it off they've come up with a beautiful tobacco sunburst finish instead of the standard jet black. With its satin finish, the APSE not only looks like a vintage instrument from the audience but it doesn't reflect the stage lights into their eyes. I even think that the finish they used contributes to the tone by making it "rounder" sounding when unplugged. Of course, that may just be in my head, but I feel like I can hear a difference. I love it when folks come up after a show and say "that guitar sounds great, what kind is it?" An extra bonus of owning RainSong guitars is that you can travel with them and not worry about damage from handling, temperature or humidity. I put my APSE in a padded gig bag and carry it on board the plane with me. It's small enough to fit in most overhead bins and If I have to check it at the gate, I still don't worry about it like I would one of my expensive wooden guitars. When I have to make that inevitable long walk through the airport terminal to make a connection, the guitar is so lightweight that I don't mind carrying it. If it gets stolen, I can replace it with another exactly like it within a day or two. I think this guitar has the perfect combination of features whether you are a professional performing guitarist or just someone who loves playing guitar. 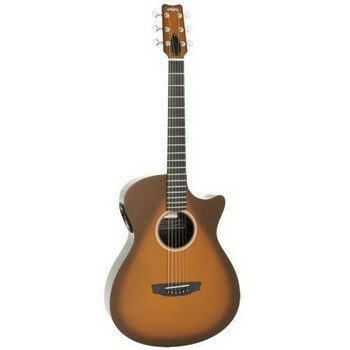 There is no better quality guitar available in this price range. Thank you RainSong for making my life so much easier. Soundboard: All-graphite Unidirectional Carbon soundboard crafted using RainSong's Projection Tuned Layering™ technique. Neck: 12-fret all-graphite NS neck and composite fingerboard fabricated using RainSong's Performance Shape Casting™ as a single piece. Adjustable truss rod. Finish: UV protective, urethane in satin tobacco burst color.